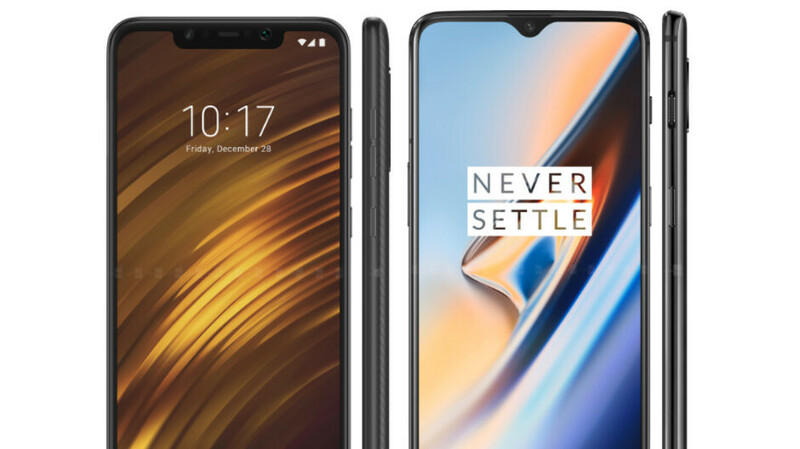 Pocophone F1 or OnePlus 6T: which one would you buy? By now, you've probably heard of this weirdly-named Pocophone F1. It's made by none other than Chinese giant Xiaomi, who founded the Poco brand to spread its reach in global markets. The first phone to come from that is the Pocophone F1 and what makes it stand out is its incredibly aggressive price. For about $369 in the US, you get a top-shelf Qualcomm Snapdragon 845 processor and a huge, modern-looking (read: has a notch) screen with almost no bezels. Well, it does have a rather unsightly chin, but that's still $369. Yes, the Pocophone F1 is a bargain for sure, but we've seen this before. Back when OnePlus was first starting out, the company launched the OnePlus One "flagship killer" for a measly $300. That one also had the top-tier specs at the time, which included a Snapdragon 801 under the hood. Now, OnePlus has grown a lot from the good old days and with growth comes the inflation of prices. The company no longer uses guerilla marketing but actually partners up with fashion brands and popular models to promote its phones, it has support centers and supply chains set up all around the world, and it's even available in the US through an actual carrier (it's T-Mobile). That's pretty huge, but has certainly shown as the OnePlus phones' pricing has went up from $300 to a starting price of $549 for the latest model. Don't get us wrong, you won't catch us complaining — by today's flagship price standards, the OnePlus phones are a crazy deal and they have improved severely in all departments since being a fledling company. The camera is no longer sub-par, the quality control has been tightening up over the years, the device build materials have that premium feel to them. But Poco did make sure to take a jab at OnePlus. As soon as the OnePlus 6T was announced, Poco came out with a "Do the Match" campaign, basically highlighting how everything the F1 has is either on par or better than the OnePlus 6T, yet the phone is considerably cheaper. Well... is it true? Would you "Do the Math" and go for a Pocophone F1 over a OnePlus 6T? Note: for the purpose of this poll, let's imagine that the Pocophone F1 has better LTE compatibility with US carriers. Because, as of right now, it looks like it will be limited to 3G speeds and won't have CDMA support. So, let's just pretend it doesn't have this issue before voting. Pocophone F1 or OnePlus 6T? Pocophone, of course... I did the math! Pft... OnePlus 6T! Pocophone, of course... I did the math! "Note: for the purpose of this poll, let's imagine that the Pocophone F1 has better LTE compatibility with US carriers. Because, as of right now, it looks like it will be limited to 3G speeds and won't have CDMA support. So, let's just pretend it doesn't have this issue before voting." Sorry...you really cannot pretend it's not an issue. It's absolutely not even an option if it's limited in such a way. I can get by without a headphone jack. I can't get by without NFC. That makes the Pocophone a complete no go for me. Absolutely! In counterpoint's study in India, OnePlus came out on top in customer satisfaction rate while Xiaomi was the 2nd worst from bottom. Now tell me again what were you saying? And anyways, Poco is itself a half baked product. Poor quality LCD, poor software with ads, poor support, poor construction, poor design, below average cameras, no nfc, no slo mo, no 4k@60fps, very old GG3, inferior charging, no hd/full hd streaming. It's a product full of compromises. Only for those who don't have $500 to spend. Otherwise it's not intended for proper users who want quality. No one did the math that Poco to reach that price point, will NOT be a package as good as OnePlus. No brainer here, OnePlus is better but 3.5 mm jack will be sorely missed. Too many compromises for Poco but for the price, it's okay. But comparison, nopes OnePlus wins. Have you been living under a rock or in an alternative reality? You need to keep in mind that other flagships have increased in price as well. In comparison, it's still a great value. Man, i would have to say this again - - What Poco doesn't tell you is that they use a low grade LCD screen for their phone with light bleeding, poor viewing angles and poor colors. - What they don't tell you is that their phone has cheap plastic construction and GG3 that breaks in even a single drop. - What they don't tell you is that they force full blown ads malware in your face all through their UI. - What they don't tell you is that they offer inferior cameras. - What they don't tell you is that they offer inferior charging technology. - What they don't tell you is that they have a poor Android update track record. - What they don't tell you is that they don't offer you NFC. - What they don't tell you is that their phone can't even stream 720/1080p videos. Although it's a great deal for the price, it can't ever substitute for the OnePlus experience. Never! And for what you're paying for that $369 Poco, you can get a much more rounded phone - think new Motorola or any number of year-old flagships. There's a hell of a lot more to making a phone than just the SoC, as you point out. Mi Mix 3 is the future. No ugly notches. Both are great phones, but I am sure that the 6T would have the better camera so that's my choice. No brainier for the U.S. The 6T will have working LTE. If you're into affordable side but you don't care on the 4G LTE network coverage in U.S then get Poco. Fortunately I care about my coverage because I live in U.S I have to go for OP6T ( tmobile ) my network. Only buy it if you like wannabe, huge a$$ notch!!! Did you fire your editor? My 11 year old son can write better than this. The OnePlus 6T hands down cause I have very little to no imagination and I know if the Pocophone F1 had better LTE compatibility in the there are at least 6 friends I know would buy it just for the price. Mix 3, it has same price with OP6T but without notch. But with less optimized software and a mechanical slider that will be easy to damage. It's an easy win for the OP6T.